Ah my favourite thing to do, Pinterest vision boards. For those of you who don’t know what Pinterest is, (you can thank me later!) its essentially a search engine but not as you know it. It’s a social network that allows users to visually share, and discover new interests by posting (known as 'pinning' on Pinterest) images or videos to their own or others' boards (i.e. a collection of 'pins,' usually with a common theme) and browsing what other users have pinned. In the past Pinterest for me used to be the place I would look to for inspiration and ideas for interior design, outfits, hairstyles - what colour should I go for this season? Then I started using it to create vision boards for my life, where did I want to travel (Bali, Tulum.Mexico, New York, L.A.), how much money I wanted in my bank account, what I wanted my business/career to look like - my ideal clients, my health and exercise regimes and finally my dream home (obviously filled with a funny and hunky man!). Those were the areas of my life I pinned. I’d got this thing down pat! That’s when I had the brainwave of creating a Brand Vision Board for my business. It really helped me to get clarity on exactly what I wanted my business to look like online. Creating this board is great for you to get clarity like I mentioned but again it’s great for people like me, the website or graphic designers. If you want to work with someone on your branding I’d suggest creating one of these so you can show them what you love. If you haven’t got an account already, sign up for one and create your first board and title it Brand Vision Board. I advise keeping the board secret and then inviting collaborators such as your website designer or photographer as and when you book them. You can invite them by popping in the email address they use for their Pinterest accounts. You may want to have separate sections within your board such as Colour, Website Layouts (if you’re thinking of creating a new website), Patterns, Photoshoot Inspiration, Logos etc. Now search for terms that you like. For example if you’re a hippy boho type of person, search those terms and see what images ‘speak’ to you. Add these to your board and if you’ve created sections, place them into their specific category from the get go. If you’re into geometric shapes and primary colours, search those terms and again see what speaks to you and pin away! Include things to do with interior design, fashion, stationary, food - don’t limit yourself in terms of what it means for your business. It’s just to get an idea of your style. Just keep pinning. And pinning. And pinning... until you’ve exhausted all your ideas. Then go back and take a look at your board and see what themes stand out. You may find, particularly colours or design elements recur throughout your board. These will be the basis for your brand! The next step once you’ve discovered the overall feel you like best, is to cut back and get real specific on your favourite bits, and start deleting the pins from your board that don’t spark as much joy - as Marie Kondo would say! If you were super picky when pinning, then you can skip this step. And voila… you now have your brand board for your business. 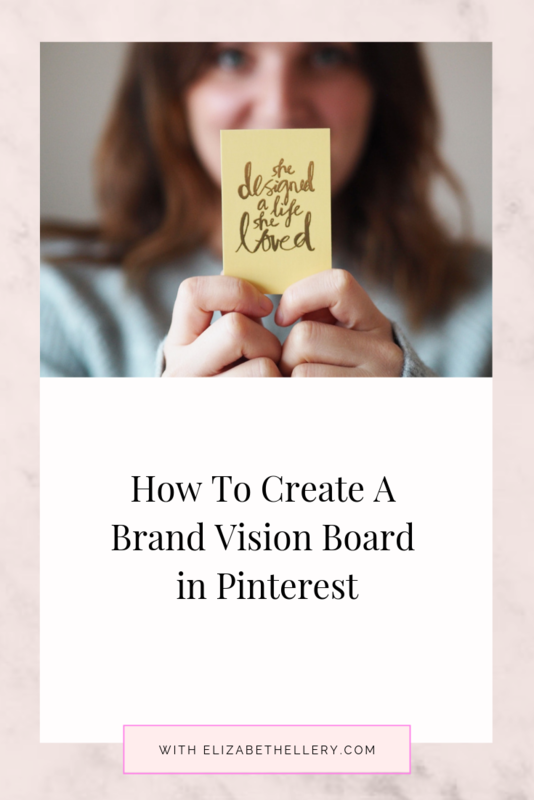 I would love to check out your Vision Brand Boards once you’ve done them, let us know in the comments below how we can find them!